Tomorrow is Labor Day...the traditional "end" of summer (even though the calendar says we still have almost three weeks to go). I have lost count of the number of times I have heard this truism affirmed over the past few days. I know the kids have all gone back to school (in some cases, almost a month ago! ), but summer is not over for me. It is still hot...and will continue to be warm for most of the month. I will still wear shorts (even white ones!) for many days to come. And most importantly of all, I will still eat every meal that I can out of doors as I continue to enjoy an array of summer vegetables that will still be available from local sources for at least a couple of more weeks. 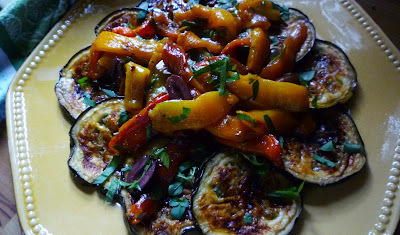 Right now is in fact the peak of two of my summer favorites: eggplant and peppers. I have been enjoying these fruits of the latter days of summer every chance I get—in pastas and pilafs, on pizzas and as the starring elements of late summer stews and ragouts. This past week, on a particularly hot day, I layered them—along with some still-going-strong cherry tomatoes—into a stunning, room temperature platter. Along with some crusty bread, it made a delightful late summer meal. And I am certain it would be a perfect addition to a Labor Day spread. The flavors are simple, straight forward and strong—making it a delicious partner for grilled steak or lamb...even burgers or brats—and at the same time virtually shouting that summer isn't quite finished yet. Place the lemon juice in a small bowl with the garlic and whisk to combine. Add the pepper flakes and 6 T. olive oil. Season well with salt and pepper. Set aside. Spread the eggplant on a baking sheet and brush both sides with olive oil. Season with salt and pepper. 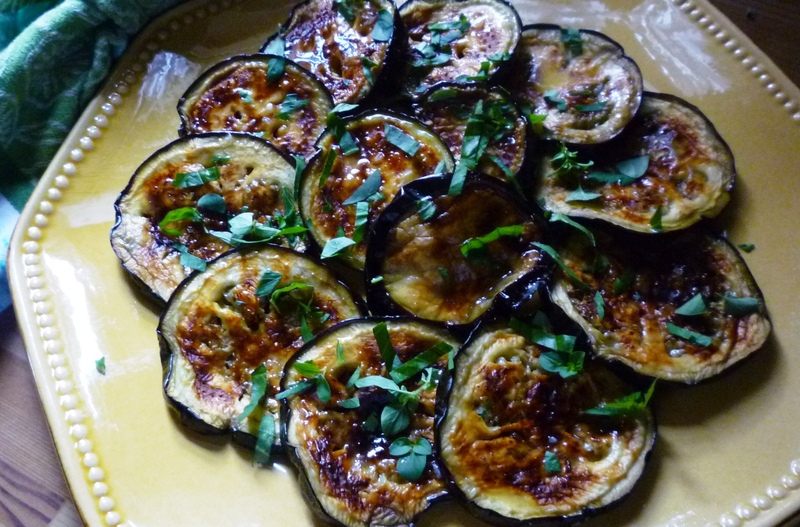 Broil the eggplant until golden brown; turn and broil the other side in a similar manner. 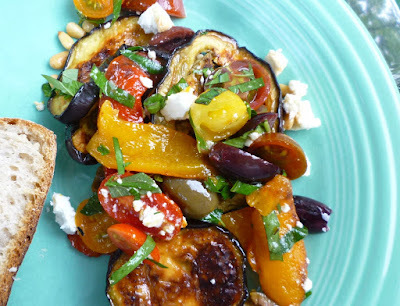 Alternatively, grill the eggplant over a charcoal fire or in a cast-iron grill pan. 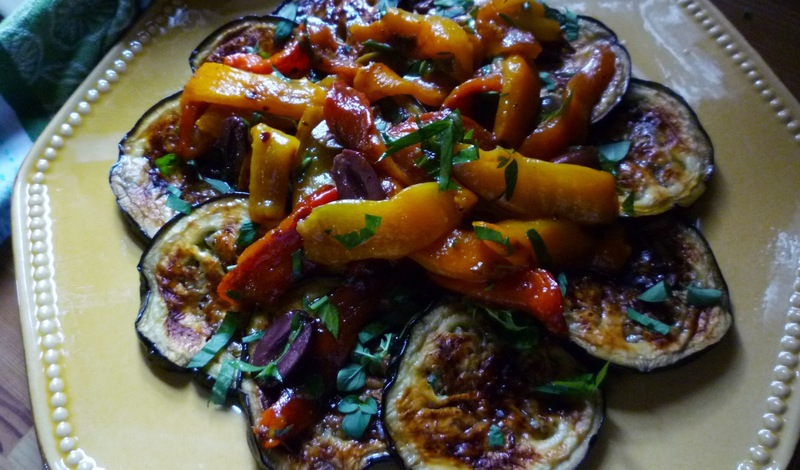 If, when the eggplant are nicely browned, they are not yet fork tender, stack them on top of one another while hot so that they will steam one another and cook through—eggplant should not be served al dente. 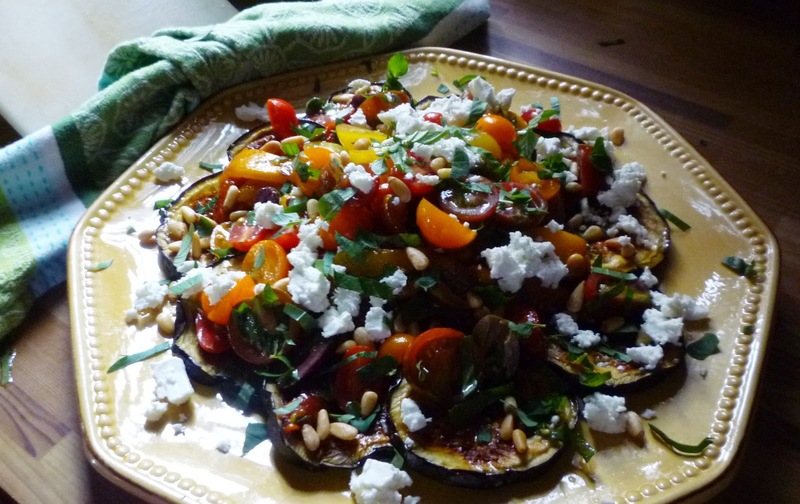 To build the salad, shingle the eggplant onto a platter or individual plates. Drizzle the eggplant with some of the vinaigrette and scatter some of the herbs over all. Place the peppers with their juices in a small bowl. Season with salt and pepper and add one or two tablespoons of the herbs. Drizzle with some of the vinaigrette and toss to coat. 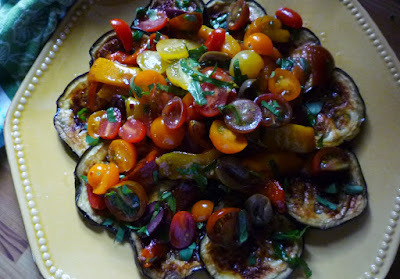 Pile the peppers attractively on top of the eggplant. Place the tomatoes, olives and another tablespoon or so of the herbs in the bowl used for the peppers. Season with salt and pepper and drizzle with some of the vinaigrette. Toss to combine. Arrange the tomatoes and olives on top of the peppers and eggplant. Scatter the pine nuts, cheese and more herbs over all. The salad may be served right away, at room temperature...or chilled and served cold. Serve with warm crusty bread or garlic toasts. Serves 4 as an entrée, 6 to 8 as a side dish. Substitution: Sliced vine ripened tomatoes may be substituted for the cherry tomatoes. 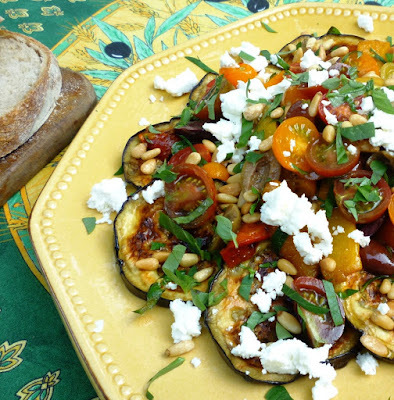 Arrange them on the platter in and among the slices of eggplant, drizzle with vinaigrette, season with salt and pepper and follow with a scattering of the olives and herbs. 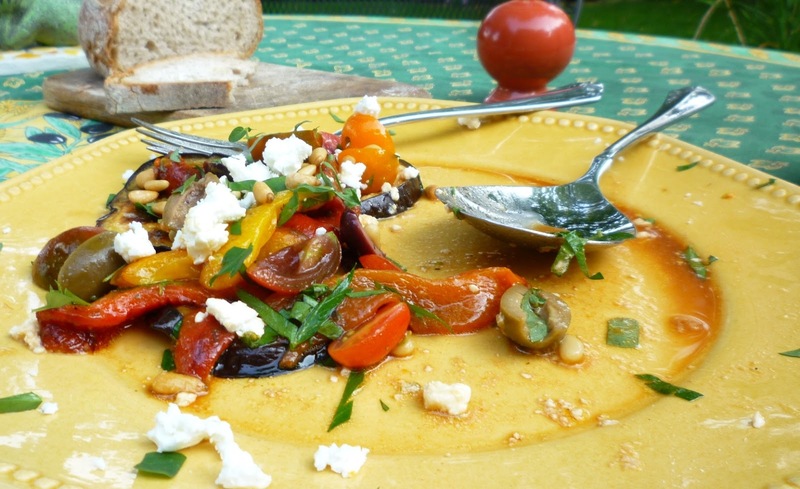 Proceed as directed with the rest of the salad, arranging the dressed peppers, crumbled cheese, pine nuts and herbs over all.